With the anxious feeling to fill tags behind us, it was time to do some hog hunting! Today we decided to fish tight to the structure of “Brown’s Pile”. The action was consistent for the better part of the day but unfortunately the size wasn’t there. At the 11th hour we decided to troll down to the Mazzaredo Islands. With time winding down on the final day of our fishing trip… Boom! We were onto a good one. 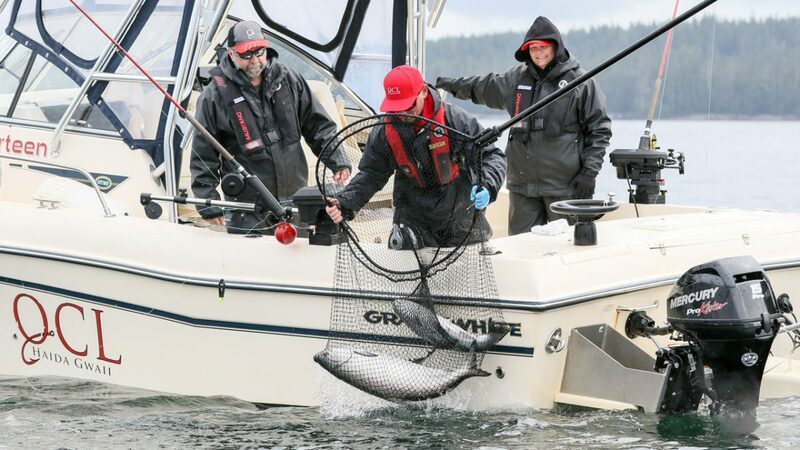 This big Chinook took a naked anchovy at 37 ft. The fight was heavy and lethargic, but the fish jumped multiple times in desperation to shake the hooks. Fortunately, we were able to keep the pins in it long enough to get him in the bag. We had high hopes of releasing a fish of this caliber, but due to the hook placement he wasn’t going to make it. Looks like he was coming back to the Bell Ringer with us after all! This one turned out to be a 41-pounder, a great way to finish the day and an unforgettable trip at QCL.